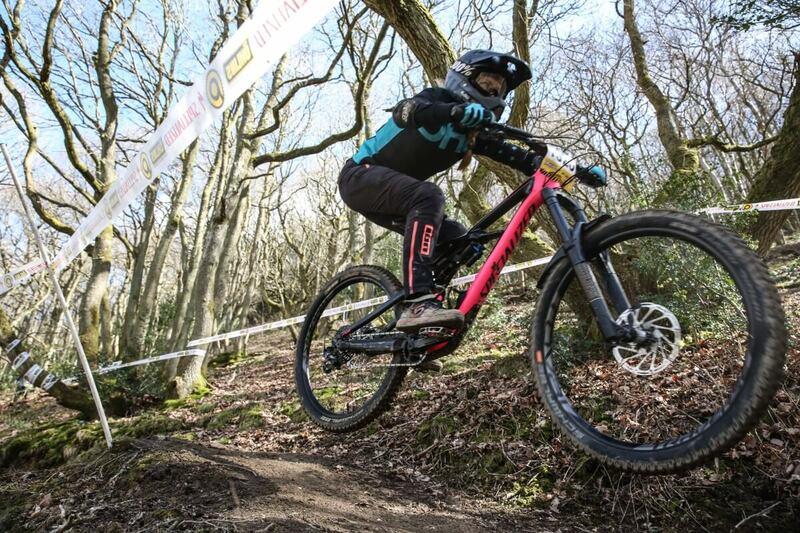 This year my main racing focus is the Pearce Cycles full series and two of the national downhill series. My race season began with round one of the Pearce events at Kinsham. The never ending winter threatened snow for the event and the track had to change due to ground conditions. The camping field was too wet for vehicles so we had to drive home after practice on the Saturday. Hopefully the weather will sort itself out for next round as the atmosphere at these events is great when everyone can camp together. I was undecided which bike I should race on; my Specialized Enduro or my downhill bike, an older Saracen Myst. The original track that had been announced was pedally and the Enduro would be perfect, but with the change I was undecided so I tried both in practice. I generally prefer riding my Enduro so in the end decided to stick with that, something that in the end was possibly the wrong decision. Practice was one of the most testing day’s riding I’ve done. I absolutely loved the bottom half of the track; fast, flowy, jumpy and that’s why I’d decided to race the Enduro and where I was in my element. The top half however was a minefield of tight techy corners and evil roots laying there to swipe your wheels from underneath you. It’s fair to say I had a few big crashes in practice, most runs in fact! I kept picking myself back up but my body and bike were taking an absolute battering and the day was really wearing me down. The girls kept me going with positivity and laughs and my lovely boyfriend, with help from Jake at sprung suspension, kept putting my bike back together. The 5.30am start on Sunday was not helped by the clocks going forward and losing an hour of sleep, but painkillers and caffeine got me back up the hill for a couple of practice runs before races. Thankfully they actually went better than the day before but with the track starting to dry out the ruts were appearing and the Enduro started to seem like it might not be the best bet, but I’d spent more time on it so stuck with it. The line-up for first runs left me going down last in the “senior women’s” category, senior women being anyone over 19. Being last meant the next rider was the first elite female, in this case Rachel Atherton! Thankfully a 2 minute gap between categories, but it still felt like my own mini foxhunt. I stayed on the bike!!! Hurray! I told myself to rein it in and get a clean run in and to my surprise it actually paid off and I was sitting in 4th with under a second off the podium. Second run didn’t go quite so well. The track had really dried out so I knew people would be putting quicker times down. I set off and couldn’t clip one foot in, the track started with a series of steep tight techy corners which I navigated with one foot sliding around trying to find the clip, I just managed to sort it but was off line and going slower than normal for the first of the treacherous roots and I went OTB and hit the ground hard. I struggled getting up and back on the bike and although I finished the run I knew I’d blown it at the top. I fell in to 6th place, a bit gutting to have crashed but still a good result for me. I felt like I found my race pace and I’m putting the crashes down to trying to step up my game and testing my limits rather than staying in my comfort zone. The results from round one were interesting for a lot of the female riders and it looks like it’s going to be a really competitive season. I have to mention the medics who came and found me on the finish line to check I was OK after my crash and again another medic came over later and found me by my bike and number to double check I was OK. Great communication from the top of the hill to the finish line to make sure I wasn’t injured! Thank you to my sponsor Flow MTB for all their support and my DHaRCO Jersey and ION trousers kept me looking rad!